A consistent theme in this letter has been the connections between items that may seem to be far removed from each other but are actually linked at the very core. If you push on one end you get a reaction in what would seem to be the most unlikely spots. Today we explore the connection between the fiscal deficit and energy policy. Everyone in Washington is starting to “get religion” about wanting to fix the deficit, with serious thinkers on all sides acknowledging that there must be reform and a path to a balanced budget. Burgeoning healthcare and Social Security costs are rightly pointed to as the problem, and entitlement reform will soon be front and center. But the fiscal (government) deficit in the US cannot go away unless we also deal with the trade deficit. As we will see, it is a simple accounting issue, and one based on 400 years of accepted accounting principles. And dealing with the trade deficit in the US means working with our energy policy. The trade imbalances among the partners in the eurozone are at the heart of the problems there as well. And while we will get back to Europe in a few weeks (remember when we seemed to be focused on Europe and Greece for months on end? ), today we will explore the trade problem from a US perspective. Happily, this problem, while serious, does have a workable solution. And it might even happen in spite of government policy, though if a proactive energy policy were developed, it could ignite a true economic renaissance. I have been wanting to explore the implications of the shale oil revolution. Old oil fields are wearing out, as peak oil advocates point out. Where can we find the huge and cheap-to-exploit oil fields to replace them? Hasn’t all the easy oil already been found? We will start in the Texas of my youth, journey to North Dakota where I was last week, and then think about the implications of that journey. There are many connections and interesting paths to explore. The letter will print a little long, as there are a lot of charts. But first, this is the month when economists and investment analysts trot out their annual forecasts. I traditionally make mine the first week in January, after I read scores of other forecast the last three weeks of the year. It’s just something I have done for many years. I make a point of reading those I suspect I might disagree with to help me with my own thinking. It helps keep me in the middle of the road. This year you can share in that experience with me, if you like. I publish a service called Over My Shoulder, in which I highlight 5-10 items a week (out of the hundred or more that I read) that I think are worthy of your attention. My reading is quite eclectic and broad, which is reflected in my choices for posting. The subscribers to Over My Shoulder have given me very positive feedback, for which I am grateful. In essence, I act as your personal filter for news that is important to your investments and money management, generally from sources you won’t encounter in your own regular reading. This year in OMS I will highlight what I think are some of the better and more well-reasoned annual forecasts. I think you will find it quite useful. You can subscribe by going here. I am often told I should charge more for the service, but I think it is a reasonable price. I certainly charge less than I would if I were paying someone else to round up these pieces, and you get access to all my sources, some of which are quite pricey. You can subscribe risk-free and read and think along with me about the coming year. And now, come along with me to the Bakken. First though, I have to take you back to Wise County, Texas, about 60 miles west of Fort Worth. A Greek goat herder named Savas Paraskivoupolis (who changed his name to Mitchell) came to Galveston in 1905. His son George Mitchell worked his way through Texas A&M and got a degree in petroleum engineering. After the war, George teamed up with his brother Johnnie and Merlyn Christie. They drilled their first well in 1952, in what became known as the Boonesville Field in Wise County, near Bridgeport where I grew up. They went on to drill hundreds of gas wells but had to shut them down because they had no way to deliver the natural gas they found in abundance. The work was done at serious financial risk, but they just kept drilling and plugging those wells. Finally a contract for a pipeline was financed by an Illinois utility, and those wells went into production. What started as Christie, Mitchell and Mitchell soon became a major employer in my little hometown and a powerful spur to the local economy. The future father-in-law of my childhood best friend was first permanent North Texas employee, back in the early 1950s, and he was eventually joined by the fathers of many of my friends. Over the coming years Mitchell would drill over 10,000 wells, with over 1000 of them being wildcat or exploratory wells. He is a legend. His story is reminiscent of that of Walt Disney, who also lived constantly on the edge of crisis in the early days of his business. In the late ’80s and early ’90s Mitchell pioneered a new drilling method called horizontal drilling. It is still hard for me to imagine, that there is a small amount of flexibility in what seems like rigid steel pipe. Over hundreds of feet of drilling, they can turn a pipe inch by inch until it describes a 90° arc. Everyone knew there was more gas deeper in the ground, but it was trapped in very tight shale formations. Mitchell and his engineers figured out how to put water under pressure back into the earth to create very minute fractures that allowed the gas and oil to be freed. This is the process known as hydraulic fracturing, or fracking. In the ’90s and especially the last decade, there has once again been an oil and gas boom in Wise county, in what is called the Barnett Shale. Except, the Barnett Shale is a far more massive formation than the original Boonesville field. Once again Texas was at the center of US energy production. The new technology opened up vast new reserves that were impossible to get to just a few years ago. And then it turned out there were potentially even larger shale oil fields scattered throughout the United States – and, as we are learning, seemingly everywhere in the world. The first modern oil wells were drilled in Poland in 1854 at around 100 feet in depth, and now exploratory wells show that 11,000 to 13,000 feet below the surface there is considerably more oil and gas in Poland and the surrounding region. In contrast to today’s deep wells, the legendary Drake Well was drilled in Titusville, Pennsylvania, in 1859 at a depth of 69 feet. And there is evidence of ancient oil drilling using bamboo pipes in China. Marco Polo remarked on bubbling springs of oil in what is now Azerbaijan. Today the Bakken overshadows the Barnett. Notice in the graph below how rapid the growth has been. More recently, permits were granted for 904 wells in August, September, and October 2012, with October being the record with 370 wells. We flew the 50-odd miles from Bismarck to the edge of the Bakken, over the famous Badlands (which I found quietly beautiful) to what Loren called the line of death. On one side of the line, if you drilled you would get a dry hole. On the other side there is an amazing reported 99% success rate. The field stretches from western North Dakota and eastern Montana up into Saskatchewan, Canada. Easy money, right? Just punch a hole in the ground and count your money. Today, perhaps, but not in the beginning. As we were flying, Loren asked me what I knew about oil drilling. I had to admit I didn’t know much, except that my best friend Randy Scroggins from elementary school wouldn’t let me invest in his oil company in 1981. Loren laughed and said Randy was a very good friend indeed – and added that “1981 was the first time I went bankrupt.” While Loren grew up in Bismarck, he would have been at home in Texas. He is the quintessential wildcatter, straight out of central casting. There is a certain infectious enthusiasm that seems to emanate from that special breed of entrepreneur called an oil man. Not only do you have to put up with the potential for drilling a dry hole, whereupon you lose all your money, you have to contend with the ups and downs in oil prices. While the major oil companies have become more conservative players, the real cutting edge is among smaller independents. And Loren is at the knife point of the cutting edge. Flying into the heart of the field reminded me of my roots in Bridgeport. Drilling for oil is not pretty. It is actually fairly messy, although I must say there is seemingly much greater care taken to keep things neater than what I remember as a kid. Flying over completed wells, when it was just the pump and storage containers, showed a relatively small footprint, with the land being farmed right to the edge of the pad. In my experience, oil wells were drilled pretty densely across the land, as you could only drill straight down. You basically got only the oil that was right underneath your well. In fracking shale oil, there is less need to put wells so close together. There is typically only one drilling pad for one section of land, that is, 640 acres or one square mile. Current technology is improving even on that, as a well can go down two miles and then turn horizontally another two miles. I took the picture below my with my iPad as we were flying into this well for a tour. That drilling pad will be cleaned up and once again become part of the farmland that surrounds it today. That is a pretty massive rig, but it can be torn down, moved, and set back up in seven days. The illustration below shows the typical construction of a shale oil or gas well. Note that the drill holes are “cemented” in around the pipes so that nothing can leak into the surrounding earth. 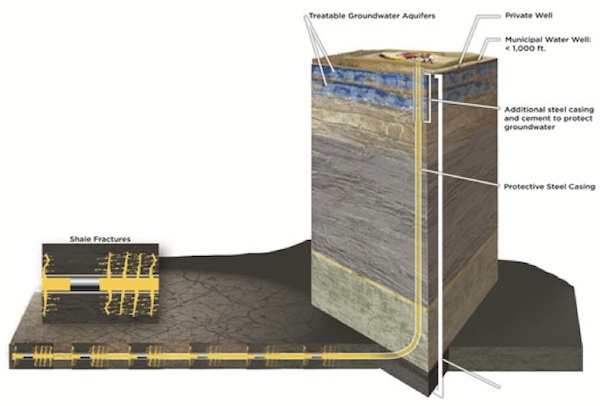 Shale oil and gas lie very deep under very nonporous layers of rock. There are very serious environmental rules about drilling and fracking (as there should be). 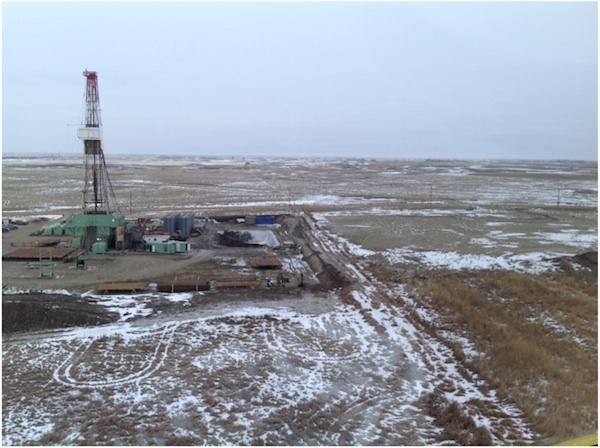 A large portion of the drilling rig is containment for the water and other fluids that come from the drilling. The waste fluids are not dumped onto the local ground. No serious person would allow fracking near the water table. That does not mean there is not oil and gas in the water table already. Stockton, California lighted its county courthouse in 1854 with natural gas from a local water well. California has thousands of naturally occurring seeps. In the Gulf of Mexico, there are more than 600 natural oil seeps that leak between five hundred thousand and one million barrels of oil per year. When a petroleum seep develops underwater it may form a peculiar type of volcano known as an asphalt volcano. The ecological system has evolved certain bacteria that thrive on the oil seeps. One of the interesting things about the British Petroleum oil-spill disaster in the Gulf of Mexico was the disappearance of the oil over a few years. While it was a true disaster, it is theorized that the bacteria multiplied to deal with the crisis. But it took a long time. There is no excuse for what BP did. Loren simply went into raptures describing the technology in each of those jewels. Since it was 9° out, with the wind chill taking it down to about -15° and I was not appropriately dressed, I might have missed a point or two. Harold Hamm and Continental Resources drilled the first horizontal well to use fracking in the Bakken in 2004. He knows something about the region. He is now telling us that there may be four more layers (which are called benches) of shale oil and gas below the Upper Bakken formation, including the promising Three Forks stratum. Just a week ago (onDecember 3), Continental announced they had completed a well in the “third bench.” The Three Forks could be a bigger story than the Upper Bakken formation, as it is much thicker. Hamm is projecting almost a trillion barrels of reserves in the area. What Loren thinks will happen is that the new drilling rigs that can move themselves will soon drill as many as 16 holes from one pad, into all the various levels and in different directions. Punch a hole in the ground, complete the well, move the rig over a bit and start the process again. That really helps keep down the cost of drilling, as does each bit of new technology. North Dakota is the third most productive energy state, on its way to being number two, behind Texas. And that is creating jobs. Lots of jobs. Unemployment in the Bakken region is 1%. $10-15 an hour for working in a fast food restaurant, if you can even find someone to work for so little. Let me give you a rundown on what I found. When we went into the “office” of the rig there was a young man who looked to be in his early 30s. He was a “tool-pusher,” which means he ran the rig. Clearly very smart and trustworthy, but he didn’t have a college degree, just lots of oil-field experience. He works 28 days, 12 hours a day straight and then takes two weeks off to go see his wife and kids. When working he lives in a small room at the rig. He makes $350,000 a year. The kid is one of those millionaires and billionaires that Obama wants to tax. An oil-truck driver makes $150-175,000 a year. All that oil has to be taken by truck to a railroad terminal and loaded onto railcars, to form 100-car trains that take the oil to refineries around the country. Loren took us to his new train terminal, where the trucks were lined up to empty their tanks and go back to another well for a load. All up and down the line, there are jobs that are begging to be filled. But working in the oil field is hard work and a difficult life. That starter oil-rig job? It looked quite dangerous to me. Campgrounds packed with small trailers are everywhere. There are “man camps,” which are glorified dormitories that can cost as much as $3,000 a month for room and board. Construction? If you can swing a hammer in the cold, you can have a job. Most people seemed to work for 14 or 28 days (12 hours) and then take a week or two off. I went to a Christmas party that night for the customers of the bank – as nice a group of people as you could want to meet, many of them local farmers who drove in for the conference. If you own a farm with mineral rights, your life has changed in recent years. As a side note, Loren pointedly told me that Greg Cleveland (founder and chairman of BNC Bank) had loaned him $1 million to get his current business started back in 1985 when no one else would. The level of trust between these two was obvious. That night, bank customers came up and literally kissed Greg on the cheeks, while telling me how he had loaned them the money to start their businesses “back in the day.” Not just in the oil business, either. That type of banking relationship is hard to find these days. Lloyd Blankfein (Goldman Sachs CEO and chairman), eat your heart out. This is small-town banking as it’s supposed to be (we had that once in Texas). As I noted a few weeks ago, shale gas will add about 0.5% to the growth of US GDP next year, in a year when we will be lucky to get 2%. This is a huge driver of jobs and growth. And it is not just in North Dakota; there are shale gas plays all over the US and Canada. Continental Resources announced a major new shale gas field in Oklahoma in October, comparing its geology to that of the Bakken. The US will be exporting natural gas within 3-4 years from McAllen, Texas, and other LNG ports are in various stages of permitting. Natural gas in Japan is over $15, compared to $3.78 this morning in the US. Europe is in double digits ($11.83). There is an arbitrage available here. Even an economist can do the math. But our real advantage may not come in exporting raw gas but rather in the chemical products you need gas to make. Not just fertilizers but feedstocks for plastics and other organic chemicals. One way for them to compete is, perhaps, to develop their own (seemingly considerable) shale oil and gas fields. But there seems to be a great deal of resistance to that. And that reluctance will help the US close its trade deficit. The chart below shows that we are spending more for energy even as we use less of it, and that drives up our trade deficit. Let’s see why this matters. As long-time readers know, I have often written about how you cannot balance private and government deficits without a positive trade balance. Let me quickly review. It is the desire of every country to somehow grow its way out of the current mess. And indeed that is the time-honored way for a country to heal itself. But let's look at an equation that shows why that might not be possible this time. We have here another case of people wanting to believe six impossible things before breakfast. Let's divide a country's economy into three sectors: private, government, and exports. If you play with the variables a little bit, you find that you get the following equation. Keep in mind that this is an accounting identity, not a theory. If it is wrong, then five centuries of double-entry bookkeeping must also be wrong. By Domestic Private Sector Financial Balance we mean the net balance of businesses and consumers. Are they borrowing money, or paying down debt? Government Fiscal Balance is the same: is the government borrowing, or paying down debt? And the Current Account Balance is the trade deficit or surplus. The implications are simple: the three items have to add up to zero. That means you cannot have surpluses in both the private and government sectors and run a trade deficit; you have to have a trade surplus. $100 (private debt reduction) + $100 (government debt reduction) - $200 (trade surplus) = 0. Bottom line: you can run a trade deficit, reduce government debt, or reduce private debt, but not all three at the same time. Choose two. Choose carefully. 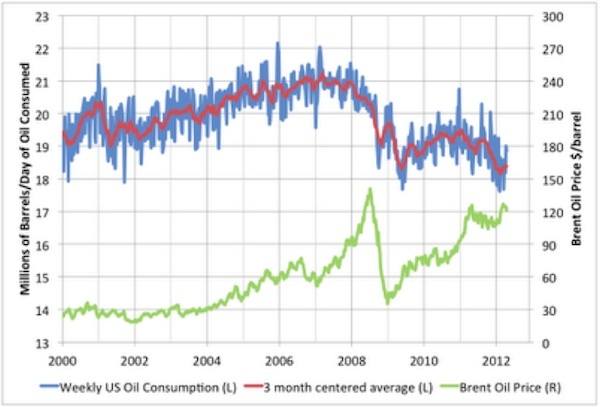 His analysis suggests that oil prices will have to remain high or go even higher for shale oil to be profitable. I think he is right on that. I have always maintained that we are not likely to run out of oil for a very long time; we will just run out of cheap oil. Thankfully, there are alternatives being developed over time. The cost of producing solar energy has dropped about 50% per decade for a long time. In another few decades solar will be quite competitive with carbon-based energy. Nuclear remains my favourite shorter-term source, but it confronts considerable political opposition in many countries. But in the meantime, we should open up public lands for commercial drilling. And we should do it for a price. Texas finances a great deal of its higher education from oil and gas royalties for wells on state land. US government land should be used to produce revenue as well. New technologies allow for environmentally sensitive use of land. Not only will increased drilling produce needed revenue from royalties and taxes, it will create jobs and allow the possibility of eliminating the trade deficit. What a happy solution! And compared to healthcare, this should be easy! And why do I think all this can happen? Because of the cast of characters who will keep raising money and drilling for oil and gas. Guys like Loren Kopseng and Harold Hamm, who are just a force of nature and will get it done. These are the true entrepreneurs, who are the main source of our new jobs. If we can keep them from being saddled with too-high taxes and too many rules, they will build that future for us. There are scores if not hundreds of these larger-than-life characters, with a few good bankers like Greg Cleveland to back them. Let’s turn them loose! I will leave Tuesday for a trip to NYC to meet with my partners in Mauldin Economics to do our own annual planning and forecast work. The recent webinar was well-received and -reviewed (start here). The next week I jump to LA/San Diego for a planning session with Jon Sundt and my partners at Altegris. I can honestly say I have never been as excited about the prospects for a coming year. There are so many great new things we will be doing. But as with Christmas presents, I can’t tell you – it would spoil the surprise. I will be on Tom Keene at 6 AM Eastern on Wednesday, so no late night for me. Thursday I go to Cleveland to stay with Dr. Mike Roizen for a night and then have some doctors poke and prod me on Friday, before heading back home. As a side note, I have run across an odd statistic. Long-time readers know that I have recommended a face cream with stem cells in it. It really does rejuvenate the skin. It turns out that over 50% of the customers are men. That was a surprise. I hear great reviews and receive thanks from all over from people who use it. It makes a great Christmas present. Go to https://www.lifelineskincare.com/content/ahead-curve-december-2012 to get yours at a very special price for the season. You will be glad you did! Today we had a birthday party for my granddaughter Lively, who turned three this week. There were 16 people at the brunch table at Del Frisco’s Grille (my new favourite Sunday brunch place – awesome food!). All seven kids once again, along with significant others, grandkids, et al. It is very interesting to watch your kids grow up, have their own successes, and deal with their problems. I remember struggling as a young man and watching my dad struggle as well. Those days back in Bridgeport? He owned a very nice gravel trucking business but went bankrupt in the late ’50s and had to start over. It was tough on him at 50 years of age to start again, and we struggled to make ends meet. I had to go to work very early. It was good for me, as I look back, but I have tried to help my kids not to have to deal with some of the same concerns. And I will admit I would not have minded a little help with college. I think Chad is going to move to Bismarck after the holidays. Abbi is getting married in the spring and will stay in Tulsa. Amanda will bring another granddaughter into my life in the spring, too. She just took it upon herself to decorate my house for Christmas, and it looks the best it ever has. And the tree, for whatever reason, is especially fragrant this year. Changes are everywhere and yet some things stay the same. And that’s the way I like it. I was reminded of that last week, when I spent the day with Newt Gingrich in DC. Of course we talked about the current political scene and the fiscal problems. He always seems to have a particular story from history to illustrate his views. But what we talked about the most was not the past or the present but the future. And not the political future but our shared enthusiasm for the accelerating pace of technological change. There is just so much to be optimistic about, even as we worry over the current economic issues. I am working with Bill Dunkelberg on our book on the future of employment, and I will then turn to writing my book on where the world will be in 20 years. This one has been in the planning stages for far too long. No one in 20 years will want to go back to the good old days of 2012. I know people sometimes think (wrongly) that I am of a bearish disposition, but that is just not true. I am just bearish on governments. Europe will be a whirlwind. Norway, Copenhagen, Sweden for the Skagen Funds, and then on to Dublin for the weekend. And then to London for an evening meeting, followed by meetings in Greece. I have my travel plans laid out except for Europe, January 16-20. If you have a suggestion or a media contact, let me know. And on the 20th I go to Geneva before heading back to Dallas on the 22nd. Quite the trip. Have a great week, and hopefully you’ll be home for the season. All the best. Dec. 12, 2012, 11:22 a.m.
John, I strongly urge you to rewrite this article after studying the terminology in this field and checking some of your numbers. I believe your analysis and conclusions would probably be very different. Chris Harto pointed out only one of many important definitions that need attention. As Chris points out: for starters you need to understand the difference between “shale oil” and “tight oil” and the wikipedia article he suggested is a good start. I think you will find the above paper very interesting and helpful. I concur with Chris’s points about the 2 Trillion barrels of “shale oil” (which by the way CANNOT be extracted by fracking )!! The “oil shale” which is the rock….. notice the difference from “shale oil”.... must be mined, then “cooked” at around 700 degrees Fahrenheit (or chemically treated) to render a suitable “shale oil” liquid product that can then be piped or transported. In other words it isn’t an oil until the Ore is mined and then baked. Then, unlike coal, which you transport and then burn somewhere else, you have the problem of mountains of oily tailings and I mean MOUNTAINS. intended to represent all of the oil, natural gas or coal contained in a formation or basin without regard to technical or economic recoverability. Because only a SMALL portion of the total amount of the fossil fuel in a deposit is ever recovered there are often large discrepancies between volumes of in-place resources and the proportion of those resources that are technically recoverable. The numbers I’ve seen suggest that only about 180 billion barrels of the 2 trillion “in-place” potential can be recovered. And remember you cannot use fracking to extract the “shale oil”. You must use a really really dirty mining and retorting method. I have only scratched the surface. Please take some time to educate yourself on the technology and carefully check your sources. I think once you look at and understand the correct estimates of how much fossil fuel Resources and Reserves we actually have (check those definitions) you may come to a different conclusion than in your original piece. There are numerous studies that have indicate that we will not be totally energy independent. We may be close for some time, but we will never be totally independent even if we forbid sale of these precious natural resources outside of the U.S. I think you owe it to your readers. They need accurate data to make investment and political decisions. Dec. 11, 2012, 4:24 p.m.
John, enjoyed your letter. I would like to add my observations regarding oil shale reserves. I am a petroleum engineer/geologist with 60+ years of professional experience. I am very familar with the Bakken oil reservoirs. I should point our that every location within the confines of the Bakken will find oil - how much is the problem. The “sweet spots” give prolific oil production - some wells intially produce as much as 3,000 barrels of oil per day. However, they decline rapidly, and after 12-18 months of production they are likely to be capable of only producing a couple of hundred barrels per day. At this point it is necessary to re-frac the well to increase production. The Bakken resource amounts to about 600 billion barrels of oil in place of which only a small % can be recovered as oil reserves. The recoverable reserves may eventually be as much a 15 or so billion barrels, but may be much less. Well costs are in the range of $6-7 million dollars including fracing. It is expensive oil. Shale oil is a different “cat”. It is an earlier form of petroleum - kerogen. There are trillions of barrels in place, locked in shale bodies. Mainly, in the Rockies. However presently there is no commercially viable system to mine and refine it. First of all it mining it creates a horrendous enverionmental problem, since the residue is a flour-like substance that must be dealt with. I did some work on the shale oil resouces in the Rifle, Colorado region in the early 1950s. 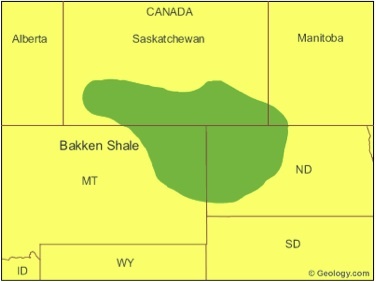 I add that I am familar with many of the basins that contain oil shale formations - the same factors, as in the Bakken, hold true. As a quick add - Geo. Mitchell and I have been personal friends for over 50 years. His older brother, Johnnie, and I were also personal friends - Johnnie had a serious stroke many years ago and lingered for close to 12 years before passing away. I consulted for Christie, Mitchell & Mitchell in the late 1950s and also knew Christie (never forget his trademark - dark blue-lensed sunglasses). www.energycrisis12Ablogspot.com e-book - The Sky Will NOT Fall - Unmasking the Green Revolution (Amazon, Barnes & Noble). Dec. 11, 2012, 3:46 p.m. It would be helpful to point out that your formula about debt reduction refers to FOREIGN DEBT only. Obviously, even if the current balance were negative, it would still be possible to reduce both public and private DOMESTIC DEBT simultaneously. It should also be noted that the vast majority of U.S. debt, both public and private, is DOMESTIC. So the main debt problem in the U.S. doesn’t revolve around exports, it revolves around domestic borrowing. But in the periphery of Europe, foreign debt IS the problem, hence exports there are critical and are basically a zero sum game within the Euro. Dec. 11, 2012, 12:47 p.m.
Can you answer two questions, out of your own immediate knowledge, without Google, without asking colleagues, but from your own direct understanding? 1. Why does methane absorb more infrared than nitrogen or oxygen? 2. If you park a car outside on a clear night with temperatures a little below freezing, why does more frost form on the roof than on the doors? If you don’t know, how do you evaluate claims about climate science and global warming? Dec. 11, 2012, 9:43 a.m. Overall I found your piece to be largely accurate and fair and balance. However you did make one common mistake when discussing shale oil. “A quick tutorial on shale oil: Global shale oil reserves are currently estimated at over three trillion barrels recoverable under current technology. The US has well over two trillion of those barrels. (Average estimates from numerous sources.)”. significant as evidenced by the Bakken and Eagle Ford and growing number of emerging shale plays, but they do not come close to the 2 trillion number quoted. 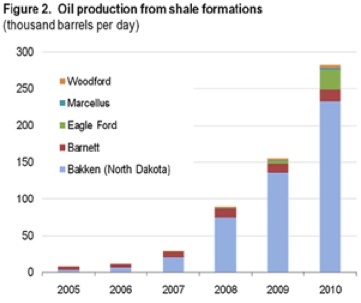 The 2 trillion barrel resources is oil shale. This is a VERY different resource. Oil shale is a substance also known as Kerogen. It is more similar to oil sands than shale oil. It exists geologically as a solid and must be heated to high temperatures, generally consuming large quantities of energy and water to extract the oil (actually bitumen, the same heavy oil found in oil sands). There have been efforts in the past to economically exploit oil shale in the Rockies, but none have been economically successful due to the large energy requirements and low energy return on energy invested (EROI). The oil shale resource is indeed huge and if it can ever be extracted economically it will become a game changer, but the basic thermodynamics of the process ensure that it will probably never be done cheaply. PS I initially posted this with the FB plugin, but I’m not convinced that it worked correctly. Dec. 11, 2012, 7:31 a.m. It seems to me that the goal, long term, is to be the last country pumping oil, gas or whatever. Once you have extracted everything you have, you are at the mercy of the remaining countries that still have the stuff. Keep extracting the stuff, obviously, and invest in technology to get to the harder stuff but as a long term strategy, use the other guys crude before you use your own. In fifty years, or whenever, as the only producer America can name her price and all those debts will magically disappear. I know that means looking after a future generation above a current one, but isn’t it about time? Dec. 11, 2012, 5:53 a.m. Very interesting article John and maybe the water issue will ultimately be resolved by the scientists. Wishing all a very Happy Christmas. Dec. 10, 2012, 11:30 p.m.
As an oil and gas professional I would like to thank you for writing this piece. It is a breath of fresh air in a world of false documentaries and media reports that have misled the public regarding the safety of fracking technology. While I may be biased, my knowledge of unconventional drilling does not alienate my values to protect the future of our environment and our water. I very much appreciate the time that you took to accurately report on this subject. I know that you have a large following and it will go a long way toward educating the public on the virtues of this technology. We are at the very beginning of a magnificent oil boom that will only end in much lower oil prices. Dec. 10, 2012, 9:30 p.m.
John, I’m not an investor of any kind other than investing what little I can in our drought-y 10 acres (Southwester Colorado). We have 1 gas well on about every 40-80 acres in our county(unmarked BP trucks to these sites, mostly). There is a whole lot of argument going on about fracking here, for many reasons. My personal insight is that our business takes us into many homes in the area and we’ve experienced first-hand water on fire from faucets, and even homes blowing up from released methane (it is ‘supposed’ to be contained or captured). Like UFO sightings, it is always dismissed as ‘natural causes’. Many people have to have water trucked in to drink after their wells get chemically altered with scary ‘stuff’. At the other end, we see a lot of disparity between the incomes of those who can and do invest and those that don’t and it often is because of the gas industry perks vs lack of ‘oil money’ coming in. Many of the nicest homes we have serviced have pictures like royal portraits of the former President and his wife on the wall - the homes appear to be affordable because they also have some oil money coming in; they can appreciate the financial perks the industry offers. There are others living here who are working 2 or 3 jobs just to maintain themselves with the basics. (As costs go up this is harder all the time). I agree with much you have laid out, like: “...oil prices will have to remain high or go even higher for shale oil to be profitable. I think he is right on that. I have always maintained that we are not likely to run out of oil for a very long time; we will just run out of cheap oil.” But, I think you left out one of the most important considerations in assessing this booming industry, and while I can’t argue the point, I can point to many online sources on this topic. It concerns us all over the long term, especially with the drought issues now pervasive in gas-drilling states: water usage in the drilling/fracking. Please consider this point. Water is ‘free’ in that we (or BP, et al) can find sources of it at no cost (but the trucking of it to well sites), but I don’t think it’s fair not to put a cost on the loss of that water, when the industry uses so much of it and ruins it while people need it for drinking or farming, or just the security of the water tables during continuing drought conditions. It seems like stealing to me and actually kinda freaks me out how this is never mentioned in regards to the ‘boom times’ for this industry and all the money people get from it while others do and will suffer in some way. I respect you (I even like you!) and appreciate your informative articles that keep me up on some aspects of the financial happenings. I am not as optimistic as you are, due to some things, like big companies seeking money over important things which are overlooked and discounted in the pursuit of that money. I think it isn’t all about money, but then maybe that is the difference between me and someone who can invest it. Thanks for the opp to respond. Dec. 10, 2012, 8:17 p.m.
We are trading fresh water for oil. Even with the best technology, we are leaving more than 70% of the fresh used to drill the wells in the hole. We need roughly 4 million gallons, on average, of water to drill one well, and we are drilling 35,000 wells are year.